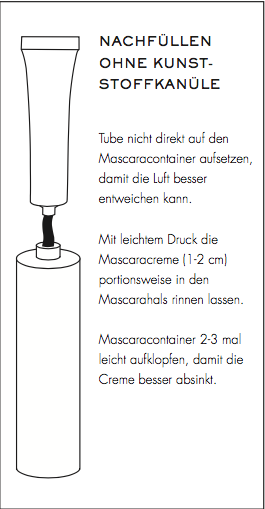 Our original waterproof cream mascara in a tube! The spiral brush gives your lashes volume and impact. Or else use our classic tube to refill your mascara. See attached sheet for refill instructions. FIRST USE: Open the membrane with the spike of the cap. For the first use with the spiral brush, push the spiral brush with a little pressure through the nozzle.